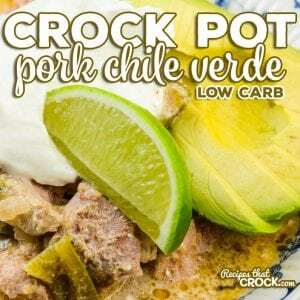 Crock Pot Pork Chile Verde - Recipes That Crock! 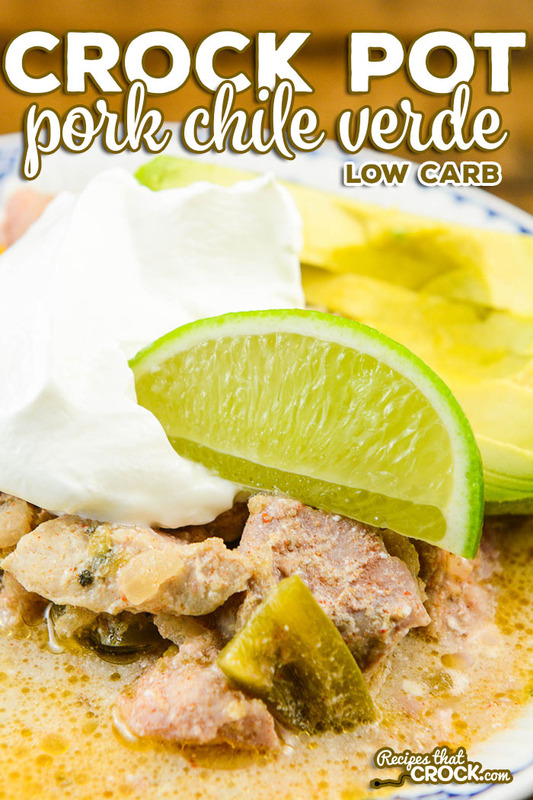 This Crock Pot Chile Verde Recipe has become a low carb family favorite in our house. This slow cooker recipe can be served up as a stew or spooned into tortillas for a delicious spin on taco night. Note: If you are looking for the chicken version of this recipe, you can find it here: Crock Pot Chicken Chile Verde. On our recent trip to Texas, we tried to cook up some regional dishes in our Camper Kitchen in lieu of eating out a lot. There was something really fun about shopping for ingredients where we were and attempting to cook up something somewhat similar to what we might find in a local restaurant. Cooking while traveling also helped us eat low carb while away from home. As it turns out, this Crock Pot Pork Chile Verde is our FAVORITE thing we made while in Texas. It is so flavorful and filling. The pork is so tender. The Anaheim Chile Peppers added just enough heat but it is easily cut by the sour cream and not too much for spicy wimps like me! Ha! Pour half of the jar of Salsa Verde into the bottom of a 6 quart slow cooker. Place pork steaks into the crock pot and top with peppers, bacon, butter and green chilies. Add spices and seasonings and top with remaining Salsa Verde. Shred pork with two forks- removing any bones and stir back into stew with 1 cup of sour cream. This recipe was inspired by (but a bit different from) one we found in Easy Low-Carb Slow Cooking. We like using our non-stick multi-cookers to make for easy clean up. We’ve made this in our Gem Multi-Cooker and our Ninja Auto-iQ. This Crock Pot Chile Verde Recipe has become a low carb family favorite in our house. This slow cooker recipe can be served up a stew or spooned into tortillas for a delicious spin on taco night. We like using our non-stick multi-cookers to make for easy clean up. We've made this in our Gem Multi-Cooker and our Ninja Auto-iQ. New to your site as of yesterday, 1/24/18. I love this recipe! Think I will make it for use in Enchiladas, adding some grated Monterey Jack cheese, and/or Cotija Cheese, crumbled and of course, chopped fresh Cilantro for garnish. Can I substitute Mexican Crema for the sour cream or would it be too thin/loose? ?